Our oceans are not yet empty but the signs are not good. The seas have always been humanity's single largest source of protein, but for the first time in history this critical food supply is at risk in many areas. Despite an ever-intensifying fishing effort, the global catch appears to have reached its limit while the demand for seafood continues to grow. 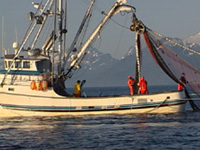 Short Version: This greatly abbreviated version of Empty Oceans, Empty Nets was created for schools, aquariums and science centers where there isn't time to show the original 55-minute version. In 15-minutes the short version manages to examine the global fisheries crisis and the forces that continue to push many marine fish stocks toward commercial extinction. It also examines new market initiatives that give consumers a powerful vote in deciding how our oceans are fished. "The best short program we've used to help our guests grasp all of the issues surrounding the depletion of the world's commercial fish stock...It gives a succinct yet thorough overview of the fisheries crisis in a way that people understand and remember...We would strongly recommend it to other aquariums...It really does the job." "Without a doubt people are moved by this film and it is definitely influencing their purchasing power to make informed choices about seafood...The movie had an impact on all age groups. One elderly woman exiting the auditorium was heard to say, "
hat movie opened my eyes and made me want to close my mouth! "...Your movie successfully presented the issues and also offered solutions which are so often overlooked by the emotional content of conservation information." "If you knew nothing about fishing, this would be an awesome introduction."